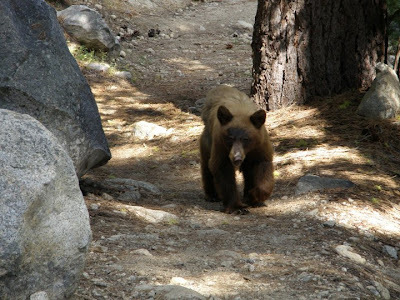 Camping and Kids and Bears- Oh My! The family vacation. Nobody could have convinced me as a child that vacation is actually more work than staying home, but as a full grown mom, I have to say, this is the case. We just recently returned from the occasional family vacation with my siblings and parents. Always an interesting experience, this one was no disappointment in the drama department. It begins of course with me wondering why on earth I decided to travel with a newborn, then I remember my constant optimism when it comes to my actual ability to deal with the trials of life. One day till lift off and I am in a full blown panic. Our Suburban, surely the largest car on the planet, is stuffed full. Why do we need so much stuff to "rough it" for three days? The requisite pre- trip oil change of course reveals heretofore unseen problems with the vehicle. ACK! My previous optimism about all the fun times has of course been replaced with neurotic rashes and itching. Am I really going insane?! The trip is scheduled to take six and one half hours! Bwhahahahah! Even with the addition of children (we calculate an extra hour or so) this is way off! More like nine! Boo Map quest! My husband, who I often refer to as a worry wort, has been talking for weeks about the problem of bears. We are going to a national park rumored to be flooded with them. But I don't take him seriously. He worries too much anyway! I talk to a friend who is a former ranger. He assures me that due to the advent of the ingenious "bear box" (a steel box to put all food that no bear can penetrate) the bears stay away. Still, there are some pretty crazy videos online showing bears actually opening cars like they are tin cans! But again, in my optimism, I blow off hubby. When we arrive at the park what is the first thing the ranger says?! "Be very careful of bears. We run at least one out of the park EVERY DAY." Are you kidding me! I have a toddler I lose in MY HOUSE and a newborn and a car that despite my three hour neurotic cleaning, surly still smells like some strange combination of food/urine/and spit up. Will we possibly survive this ordeal?! When we arrive at the actual campsite, my brother and his wife inform us that they have already seen a bear! (Yes, that is his actual picture above.) They do however, appear to be pretty tame, he actually walked away when they told him to. But the trip was fun. We hiked to a waterfall. We climbed this fabulous cliff where you could see forests for miles in every direction. The beauty of this country is truly amazing. It was a huge blessing to be there and watch my kids just have the time of their lives with their beloved aunts and uncles and grandparents. And of course, nobody was mauled by a bear or a mountain lion. As it turns out my children don't really mind not showering or brushing their teeth. They also really enjoy fruit snacks despite my assurances that fruit snacks are actually just gummy bear candy in disguise and the only reason anybody thinks they are actual fruit is very clever marketing. We only noticed one family moving away from our campsite because (I assume) the noise that was generated by ours. I tried to be friendly....but, you can't calm crazy. It turns out that the toddler is a natural rock climber- and as an added bonus- nobody cares if you soil yourself in the woods! The ride home was one for the books though. There was much weeping and wailing and gnashing of teeth. Despite the fact that mom and dad were pretty psyched to go home and shower and sleep on an actual mattress, the children wanted to spend forever in "the wilderness". The drive of course consists of the the first two hours looping down a huge mountain on curvy roads. The six year old beings wailing and complaining of car sickness. I try to talk him out of it. "Just tell yourself you are NOT sick. Your mind is very powerful!" He is not buying this line of thinking. Oh no- he is sick and he is going to puke, gosh dang it! I start to believe him. This could be serious. I pass him back a box (by the way, if somebody wants to make a million bucks off of moms, just sell puke bags like on the airplane in the kids section of the grocery store) just in time for him to hurl up his breakfast into it. Breakfast consisted of three packs of fruit snacks and a tangerine, just in case you wanted to visualize the experience. The next thing that happens really blows my mind, and true to form, it makes me laugh out loud. It is an unfortunate character flaw that I respond to moments of stress with inappropriate laughter. What happens next you ask? The four year old, sharing the backseat with big brother, upon seeing him vomit, does so herself about five seconds later. Honestly, I have seen this happen in the movies, but never in real life! Somebody puked in my car and it made somebody else puke! Now everybody is crying, except for me. I of course, the sensitive mother as usual, am laughing like crazy in an effort to avoid my own personal tears. By the way- if you ever want your kids to hate fruit snacks, feed them to them for breakfast, then drive down a mountain at top speed, watch everybody vomit and promptly swear off fruit snacks for life. It was not my intention, we just didn't have time for real breakfast- but it was a small bonus to the whole experience. We made it home in one piece. The kids quickly forgot about the horrors of the drive and are definitely looking forward to the next wilderness adventure. Two days later I am still working on camp laundry. There is probably still a little dirt in unseen crevices and I have learned that vacation fun is lots of work for mom and dad- but totally worth it for some fantastic family memories. And which park did you go to? You're braver than most. I think a regular vacation while staying in a hotel would be stressful, but camping? No thanks, haha. Also, this reminds me of an episode of Everybody Loves Raymond where the wife ends up taking all the kids camping by herself because Ray had to work. She walks thru the door, filthy, tired, kids a mess, and a very irritated look on her face, and the mother-in-law turns around and says, "I don't know what you're so stressed about, seeing how you just got back from VACATION." haha. The look on her face was priceless. haha! it was a good camping trip!!! Family vacations are some of my best memories, I'm sure your kiddos will feel the same. The puke story will go down in the books for sure. When we blog about times when we were able to stay somewhat positive through difficult circumstances, we help other moms and dads to feel understood and not alone. You really are helping them.